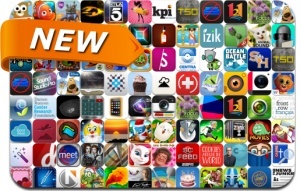 If you’re looking for a new app to try, you’re in luck, 91 iPhone, iPad and iPod touch apps just hit our database. This new apps alert includes Badly Drawn Movies, Life is Magic, The Icarus Box, Lost Treasures of Infocom, Super Mega Worm Vs Santa 2, More Cakes!, Mr. Potato Head Create & Play, WordWorld: Fun with WordFriends, Cubie Village, TableTop Translator, Nemo’s Reef and many others.